Trust me. 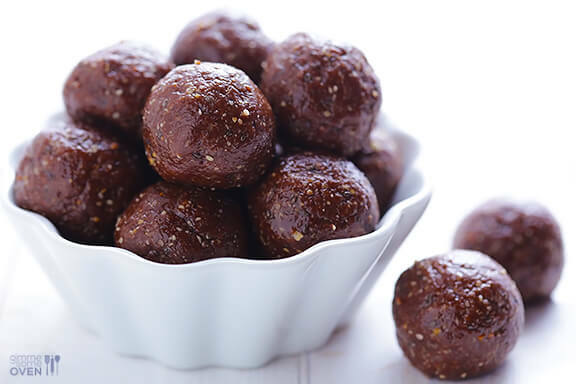 You’re going to want to try this Nutella energy bites pronto. But first, I want to tell you about the inspiration for this recipe. If you’ve been following along on the blog or on Instagram this summer, I have been doing a series of “missions” with Skinny Cow and their #WoCave campaign. The first mission was to host an in-home cooking class with a professional chef, where we learned how to cook a delicious 7-course tapas meal. But when my next inspiration box arrived in the mail full of pink workout gear, I realized that my second mission was going to be much more along the lines of burning off calories than consuming them. 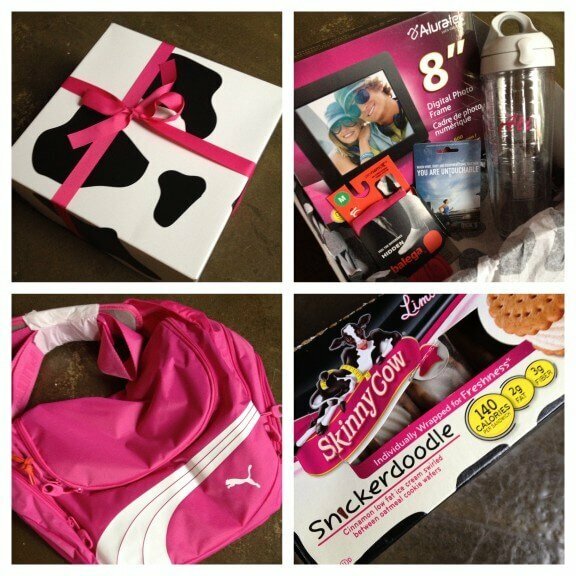 My second “mission” box from Skinny Cow included all sorts of fun workout gear — including a cute pink bag, pink socks, digital photo frame, a sporting goods store giftcard, and even a water bottle with my name on it!!! (I was a little too excited about that last one.) And then of course, we also got to try a batch of new snickerdoodle ice cream sandwiches from Skinny Cow – YUM! That’s right! My mission was to gather a group of girlfriends together to try a “new” fitness experience. So for the first time in 15 years, I gathered up my courage (and a pair of new ballet flats!) 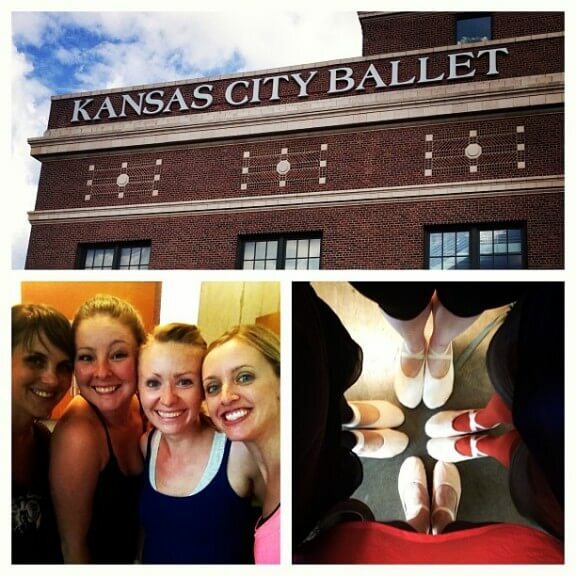 and attended my first adult ballet class at the Kansas City Ballet School. While this was definitely a new experience, I admit that the world of ballet is definitely not new to me. Back in the day, I used to be a very serious ballet student. I danced for about a decade up until I was about 14, mostly at Friends University under the instruction of a strict classical instructor who had us sweating through super intense classes multiple hours a day, nearly every day of the week. I enjoyed it, and I think back then I was actually pretty good at it! But just before I began high school, it was discovered that I had advanced scoliosis that was progressing quickly. So within three months, I was swept in to have major back surgery, which pulled me out of school for the fall and out of my ballet program for good. Pretty sure that I hadn’t set foot in a dance store since I was 15. (Hello sequins, point shoes, and tutus!!) 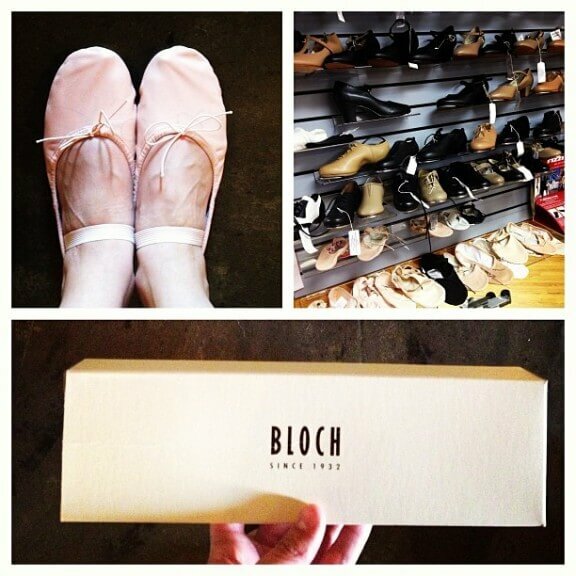 I love my new ballet shoes! Still, I had devoted so much of my life up until that point to ballet, and loved to dance. So I took any chance to do smaller dancing projects in music theater shows or with our high school “poms” dancing squad. (Although I’m pretty sure those routines would have made my former ballet instructor faint…or blush!) Even in recent years, I have become a big fan of ballet-inspired workouts like The Bar Method and Barre3. But none of those quite compared to my first love of ballet. The beauty of the art form, the intensity of the workout, the discipline of the classical form, and just getting to enjoy and experience it alongside friends is like none other. And even though I’ll never again have the flexibility or be able to prance around for hours and hours like I did when I was a kid, I’ve still always wondered what it would be like to try ballet again after all these years. The entrance to the Bolender Center at the Kansas City Ballet School. Stunning! Coincidentally, I recently found out that two of my friends (and fellow book clubbers!) also danced for years as kids, and had also thought about trying an adult ballet class at some point. So when I heard that my second mission from Skinny Cow was to tackle a new fitness “experience” together, we decided to gear up our courage and sign up for a beginning adult ballet class together at the Kansas City Ballet School. The KC Ballet has an amazing reputation in town, but I was especially excited to get the chance to see their newly-renovated home in the Bolender Center downtown. 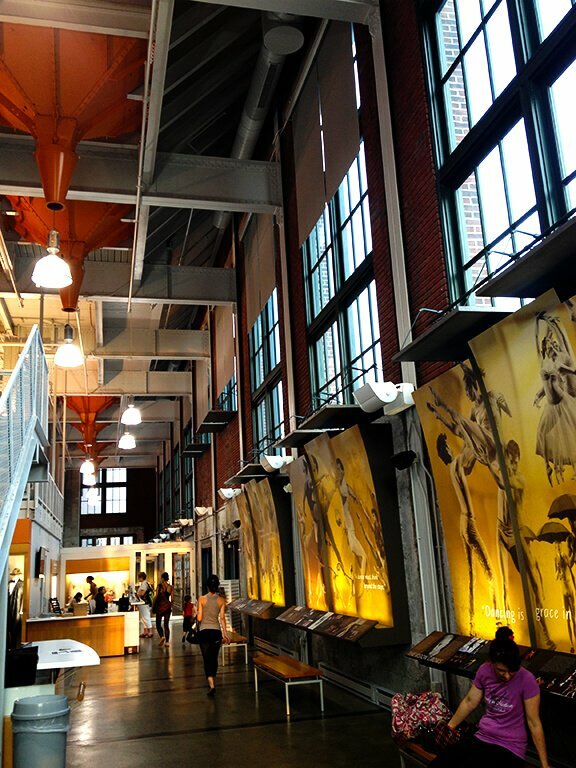 One of my favorite architecture firms helped transform the 100-year-old Union Station power house building into this gorgeous state-of-the-art ballet center, complete with beautiful sunlit studios with soaring ceilings and brick walls, and a new performance theater for their dancers. It is an incredible sight to see, and makes me so proud of our city! So grateful to share the experience with my friends (left to right) Joyelle, Sara and Kristen. And by the way, these girls can DANCE! I have to admit that the day of class, though, I was a ball of nerves!!! I had no idea what to expect from an adult ballet class — if I would be able to actually do it, if the instructor would be nice, if I would be wearing the right clothes, if I would trip over my feet and break my ankles, oh yes, I realized I was totally like a kid on her first day of school! But as soon as I walked into the Bolender Center, I strangely felt like I was coming home. The facility was stunning, the energy in the air was contagious, and I quickly learned that the Kansas City Ballet School has the absolutely most kind and welcoming staff! They graciously answered all of our questions, and helped show us to our studio. It felt like the craziest moment of deja vu to slip on ballet flats and walk into a ballet studio again. But my nerves faded away once class began. It was so fun!!! Gone are my days of ballet classes that were overly competitive, intense, and exhausting. This class was totally accessible to students of various levels, and it was clear that everyone was there to support one another and enjoy the experience! We instantly loved our instructor, Sean, who proved to be an excellent teacher and had us cracking up with random stories and trivia throughout class. And we loved getting to re-learn the steps of our childhood in this gorgeous studio with the evening sun setting over downtown in the distance. But I think more than anything, we all just loved getting to dance again. And better, getting to dance together. It was another reminder of why I signed on to do the #WoCave campaign with Skinny Cow this summer. Basically, the campaign is all about celebrating times when you can truly let go and be yourself amongst a group of close girlfriends. Many of those times for me seem to be centered around conversations and glasses of wine and good food. But let me tell you — pulling on ballet flats and walking into a brand new class and stumbling through pirouettes in front of my friends and a room full of strangers was a totally different kind of vulnerability. But it was so worth it, and so much fun, and I’m pretty sure that the feeling of accomplishment we all shared as we walked out the door will be one of those memories I’ll have forever. 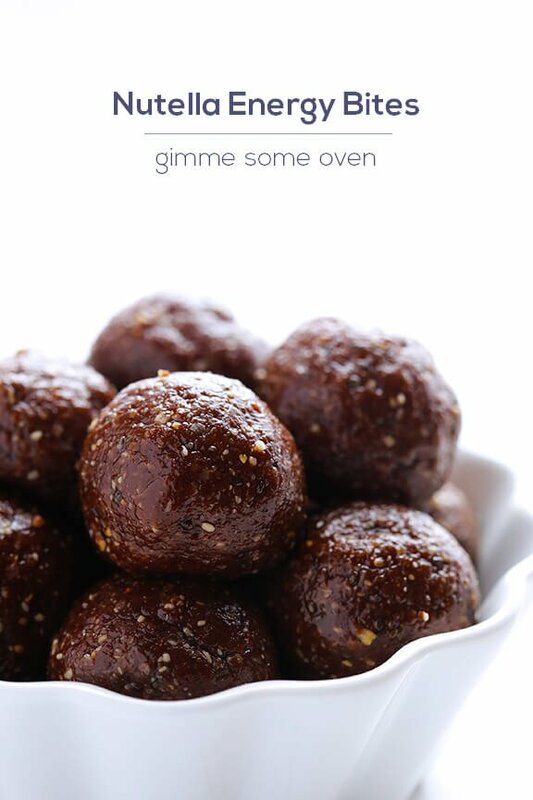 Ok, back to these delicious energy bites I mentioned earlier. With any good workout should come a good workout snack. And since Skinny Cow is all about healthier treats, I decided to make a “healthier” no bake dessert that could even give a boost of energy before a ballet class. So allow me to introduce you to my new creation — Nutella Energy Bites! Ok, I admit that these guys won’t win the absolute healthiest snack on the block award, since they do feature some of that delicious chocolate hazelnut spread that we all love. 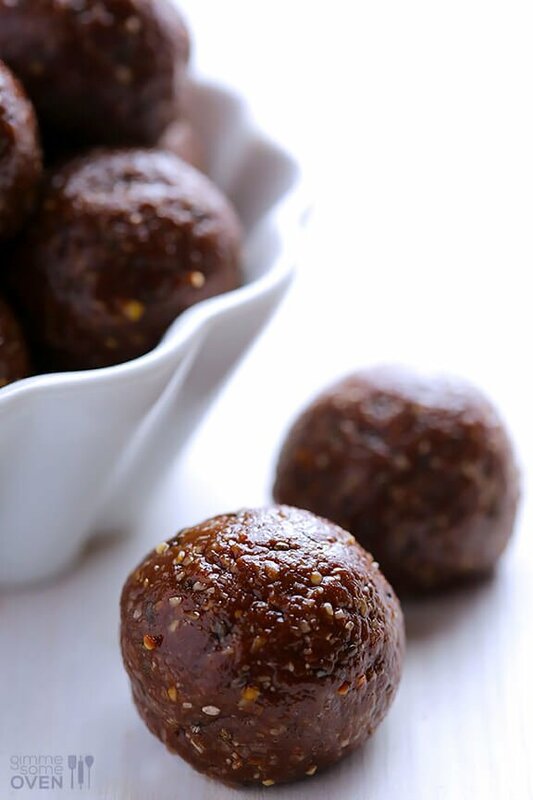 But they are packed with whole ingredients like honey, oats, coconut, nuts, flax seed, and chia seeds, and they can literally be whipped up with your food processor in minutes! I like to form mine into little 1-inch balls, but feel free to portion out whatever size you’d like to enjoy for breakfast, dessert, or an extra boost of energy before a workout. My friends and I all love them, and I’m pretty sure you will too! 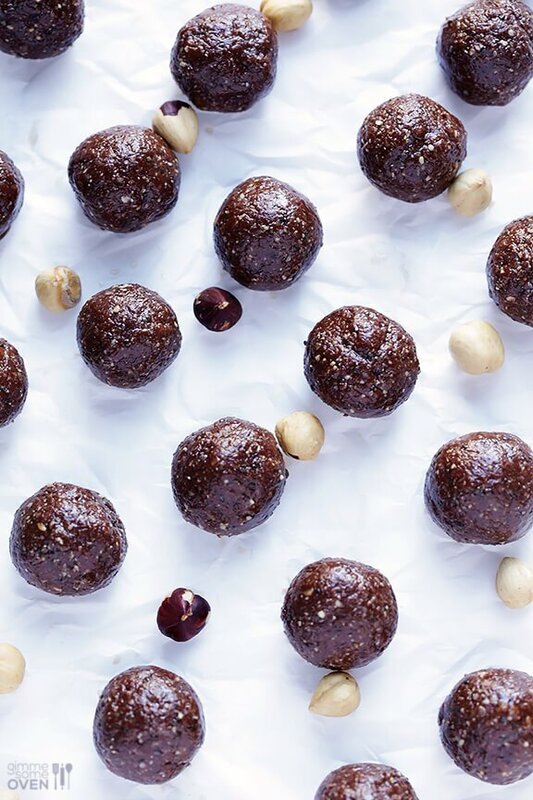 These delicious no bake energy bites get an extra chocolate and hazelnut kick with some Nutella! 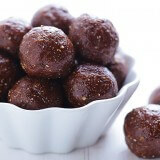 When mixture is cool, remove and roll into balls of your desired size. (Mine were about 1-inch in diameter.) 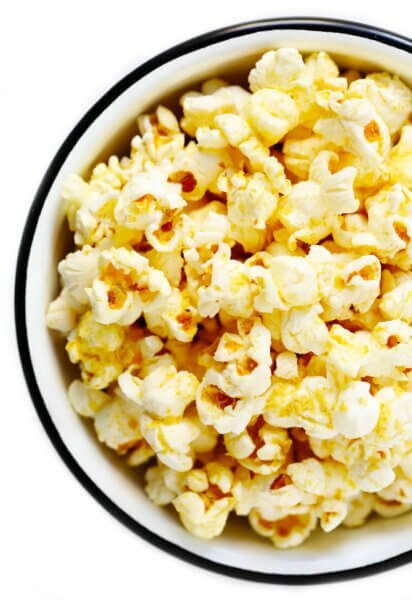 Enjoy immediately, or refrigerate in a covered container. Disclaimer: This is a compensated post from Skinny Cow. I am partnering with them on their #WoCave campaign this summer, but all opinions are 100% my own as always. Thanks for supporting the brands which help make this site possible! These look great. Thanks for offering suggestions for substitutions…do you have one for coconut? Thanks!